Pennsylvania Athletic Trainers’ Society President John Moyer, LAT, ATC writes an article for the bi-monthly Training & Conditioning magazine. The article focuses on heat illnesses and their prevention, athlete education about heat illness, and instituting policies to protect student-athletes. The bi-monthly magazine Training and Conditioning (T&C) is distributed to many health care professionals including athletic trainers. The magazine contains articles to help promote healthy fitness regimes, healthy nutrition as well as general fitness tips from professionals across the country. 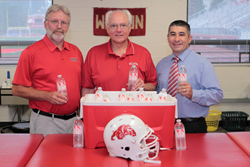 The article features a picture of the PATS President with George Fiore the Principal of Wilson West Lawn High School and head football coach Doug Dahms, both of whom John worked with to implement heat acclimatization policies at Wilson. Moyer also uses education as the crux of getting new policies concerning concussion management and sudden cardiac arrest procedures put into place at the high school. The article talks about educating different groups of people, parents, student-athletes, and administration, and bringing them all together to make sure that all are on the same page to promote the safety of student athletes. Not only did PATS President, John Moyer, help educate the PIAA about heat illnesses and help institute rules for the Commonwealth of Pennsylvania, he has now helped educate the readers of a nationwide magazine. For more information regarding this topic or to schedule an interview with PATS President John Moyer, LAT, ATC, please contact Linda Mazzoli MS, LAT, ATC, PATS Executive Director at patsexecutivedirector(at)gopats(dot)org.